The peripheral system has been designed for up to 8 doors respectively groups of doors of maximum 8 doors each. 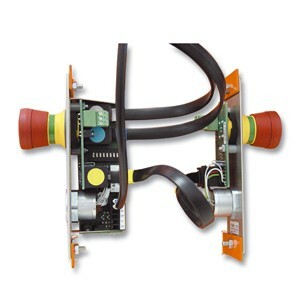 All intrasystem components are connected by pluggable cables. Except for the alimentation these are flat cables with RJ45 connectors. 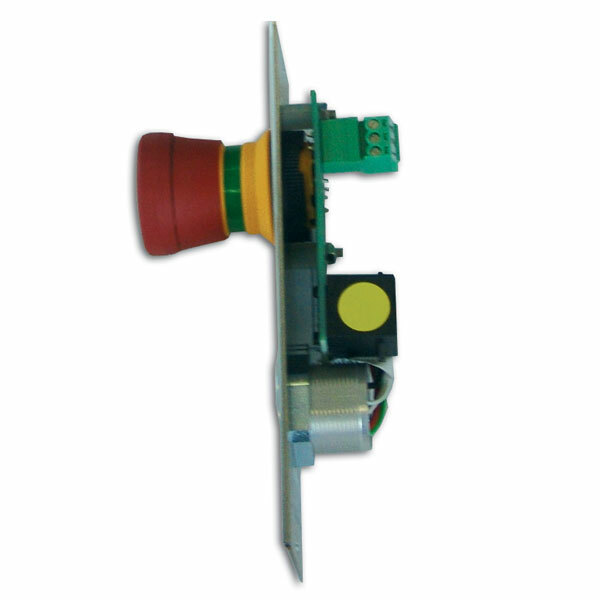 The peripheral DICTATOR interlock control system is the most flexible type of the interlock control systems. Its modular structure offers the possibility to meet an extraordinary number of special requirements. The doors of the interlock system are directly controlled by the control terminals on the doors. The distribution boxes work as junctions between the control terminals. Depending on the number of doors in the interlock system and their spatial arrangement, 1 to max. 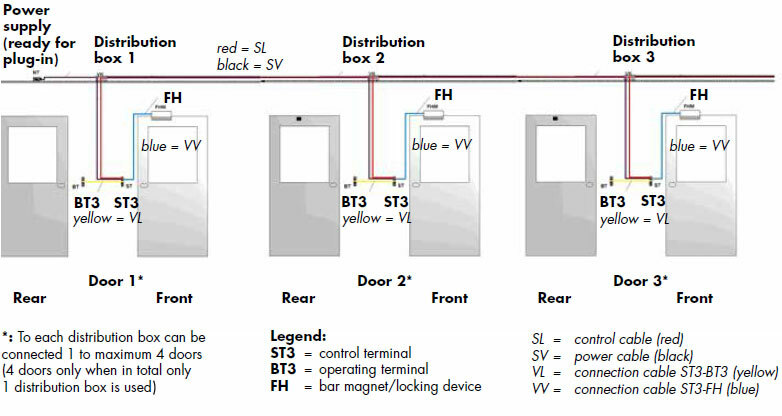 4 doors can be connected to a distribution box. The distribution boxes are connected by pluggable cables, one for the power supply and one as control cable. 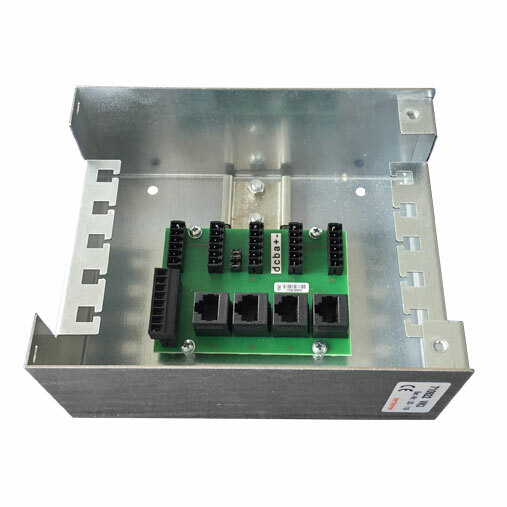 The distribution box is connected to each of its respective doors by a pluggable control cable and power cable. Every door needs a control terminal. In case the door shall be controlled from both sides, an operating terminal has to be mounted on the other side of the door. As this is controled by the control terminal, it does not need an elaborate circuit board. The locking device of the door (bar magnet, electric strike etc.) is connected directly to the control terminal. All control cables, also the one to the locking element, are simple flat cables with RJ45 connectors. If necessary, it is possible to lengthen them by a connector to a maximum length of 15 m. The system also offers the possibility to integrate the interlock control system in a facility management system, to realize special functions, to output status information etc. The core component of the peripheral interlock control system: Here are determined the relations of this door in reference to the other doors of the interlock system by DIP switches. Normally an additional terminal is required for the other side of the door. This operating terminal is connected to the control terminal by a flat cable with RJ45 connector. The distribution box has been designed for 1 to maximum 4 doors. Both, the control cable and the power cable, are simply clipped to it. 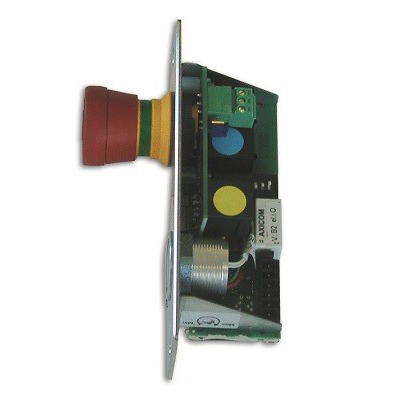 In addition it offers space for the relays needed for additional functions. All control cables and the connection to the locking devices are flat cables with RJ45 connectors. The cables and the corresponding sockets are clearly marked by colours to prevent any faulty connection during installation.